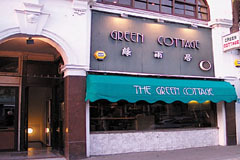 One of the longest established restaurants in North West London, The Green Cottage has been serving superb food for over 30 years. The regular clientele repeatedly to take advantage of the sumptuous and very reasonably priced range of dishes on the menu. The restaurant prides itself on maintaining its very high standards of both the cuisine and the service. For that special occasion why not ask us to arrange something truly different, such as Suckling Pig, Lotus Leaf Rice or Fresh Eel (ordered in advannce). Ideally located between Swiss Cottage and Finchley Road tube station, this restaurant has over 30 years of service to local customers. The simple decor means that customers feel comfortable and the food is not over-complicated. Most famous for its Cantonese Roasted Duck, which is freshly prepared daily. Items not on the menu can be prepared in advance and dietary needs are cared for as well. Parties can also be catered for. Open every day noon-11.15pm (food served all day). All major credit cards accepted (not Diners). 10% service charge.